This is an excerpt including the introduction and first three chapters of the book Blessed Chaos, released in kindle and print format on November 22, 2014. Ashley Wells has answered this question countless times. Ashley, and her husband Michael, were licensed to accept a placement of up to four children aged eight and younger into their home through their local foster care system. They didn't realize these parameters would exactly describe the children God would bring into their lives. In April 2012, after ninety minutes to prepare, Ashley and Michael became the parents of an eight-year-old boy, five-year-old girl, thirteen-month-old girl, and a two-and-a-half-week-old baby boy. Their journey included the typical “roller coaster” ride of emotions and setbacks, yet through God’s grace they persevered in the journey. On November 22, 2013 Michael and Ashley welcomed these four children into their family forever through adoption. Releasing on their one-year adoption anniversary, Blessed Chaos: A Journey through Instant Motherhood is an inspiring memoir documenting Ashley's journey becoming a mother through foster care adoption and the lessons she learned along the way. 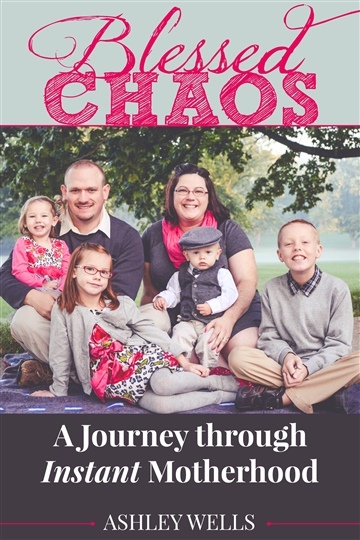 Blessed Chaos is written with the prayer to encourage women in the midst of their chaos, enlighten readers on the foster adoption process, and inspire people to think about how they are called to support foster children and foster parents. Ashley Wells strives to live alive and passionately pursue life. This means she is trying to thrive, not just survive. She doesn't want to be an innocent bystander to her own life. She wants her life to mean something. Ashley is honored to use her words to encourage others online, through her books, and also through speaking opportunities. She has three books under her belt, and many more ideas for future titles! She also loves to help others bring their message to life. You can find all of her projects at http://www.1031media.com/. Ashley lives in Louisville, KY with her husband and four children. Her family has been blessed by adoption and she considers it a privilege to advocate for orphans and at-risk children, as well as encourage foster and adoptive moms. "As a mom who adopted internationally, I found it very interesting to read this account of a different type of adoption: the journey to parenthood via foster care adoption. Ashley did a great job of describing the uncertainty inherent in this type of adoption, as well as the challenges children and parents face as children are settling into a new family. I was rooting for them the entire book and I think other readers will be too."